Was it really 2005 and how does a date with a two at the start feel so long ago? That was when the Rock and Roll Hall of Fame honored Sam Cooke as part of its annual Music Masters festivities. Somehow, we got wind of the impending star-studded concert. I even had enough time to read the thick biography referenced in the promotional materials. The night was long and fantastic, capped by Aretha Franklin as well as featuring more highlights than I could easily be crammed into a lifetime, let alone a few hours. Was it really December 11, 1964 when Sam Cooke died? I was barely walking and not yet talking. Such a brief overlap in our lives realistically counts for nothing. From the first moment I heard him sing, he was already dead. Everything that he would ever do had been done. That 2005 fete hosted by the Rock Hall featured a couple artists who had known Cooke, a couple more that were contemporaries, quite a few like me that barely overlapped his life, and one or two who were born long after. there has long been this pantheon of pop musicians that sit on their own musical Olympus because something about them rises above all the rest. This is no knock on the ones that I love, but I think it’s pretty clear that Elvis Presley and John Lennon and Frank Sinatra and Charlie Parker are sitting there with Billie Holiday and Woody Guthrie. (It’s true in other areas also, from the sciences through politics). The pantheon itself as well as the very idea that such a thing exists is a social construct- a way to bring order to a mass of information. Some of these artists have been up there as long as I can remember. Their pedestals may have shaken while I re-evaluated them at some stage. A few were added as I learned more about them, but they were always familiar. One aspect of the “social construct” nature in all this would be the lack of any real surprises. None of these people just appeared and their music has always been around. Moreover, they exist as personalities and icons as much as artists. Sam Cooke has a seat, too, and he probably always has for me, but that’s due to the timeless nature of his music and his voice. Let’s try an experiment. Think of one of the members of your pop music pantheon. Play their song. As much as it is an aural experience, you also see them in your imagination with all their defining gestures and physical attributes, dressed in some well-known attire. 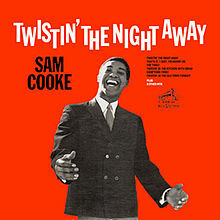 Sam Cooke’s music never felt accompanied by an image for me, which is strange. Of course, recognizing his background and the world at the time of his greatest living popularity, that in itself is an accomplishment. Somehow, Sam Cooke transcended my limited perception of the Chicago and the African American experience of the 1940s and 50s and moved on to ethereal brilliance. You’ve Got to Check This Out is a blog series about music, words, and all sorts of artistic matters. It started with an explanation. 89 more to go.